Do not discard cucumber peel it has many health benefits. The benefits include its beneficial effects in eye disorders, vitamin A& C deficiency, constipation and bones and muscles disorders. However, cucumber peel is difficult to eat because of its outer skin and due to its taste, but now you can enjoy its benefits too. Let use first discuss how to use and eat cucumber peel for maximum health benefits. Cucumber has high nutritional value, so it should not discard. It can be used by making its paste and adding some amount of honey in it for making its taste better. * Generally, perfect amount of cucumber peel for edible purposes is around 5 to 10 grams per day. Cucumber peel is difficult to digest for some people, so they should try following way to eat this. Add black pepper in this mixture makes it easily digestible and enhances its nutritional absorption into the bloodstream from the intestines. You can also drink cucumber juice with removing its peel to have cucumber peel benefits described in this article. Just process your cucumbers with peels in juicer and prepare a juice. Add some water and honey according to taste. You can drink this juice for having benefits of cucumber peel. You can also prepare smoothie by using cucumber with its peel. Add rock salt to enhance taste or you can also add sugar in it. You should include cucumber and other salad ingredients in your diet to have a good amount of fiber as well. Men need to consume 35 grams of fiber in a day and women need around 25 grams per day, so it is also necessary to take fiber rich diet. 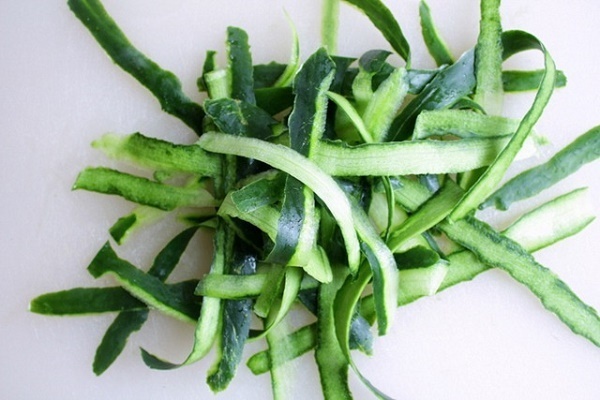 Cucumber peel is a good source of fiber, which is mostly insoluble in our digestive tract. It helps to create bulk formation and eases in passing stools normally. So, cucumber peel is effective remedy for constipation. Crush cucumber peel to make its paste and put cucumber peel paste into a glass of water. Now, add 2 teaspoons of honey and mix all ingredients. Drink this mixture on empty stomach in early morning. It will aids in removing constipation and regularizes your normal bowel habits. Inner part of cucumber contains soluble fiber content, but cucumber peel contains insoluble fiber, which is more beneficial for expelling stool from the intestines due to its sweeping effects. One cucumber peel can provide 1 gram of insoluble fiber. Cucumber peels improve eyesight due to its natural beta-carotene. Beta-carotene is a type of carotene found in dark green and colorful fruits and vegetables. It is beneficial for eyes and improves vision. 100 grams of Cucumber with its peel contains 110 IU of vitamin A.
Cucumber is low in calories. Its peel has added benefits because of insoluble fiber. This insoluble fiber cleanses the intestines and helps in bulk formation, so it makes you feeling full abdomen and decreases the food cravings. So if you are trying to lose your weight, eat unpeeled cucumber regularly. You now know about the benefits of cucumber peel, so eat cucumber with peel for maximum health benefits.